Bluffdale • Unified Fire receiving $343K to protect new Utah Data Center. This Monday, June 10, 2013 photo shows a ground level view of Utah's NSA Data Center in Bluffdale, Utah. The nation's new billion-dollar epicenter for fighting global cyberthreats sits just south of Salt Lake City, tucked away on a National Guard base at the foot of snow-capped mountains. The long, squat buildings span 1.5 million square feet, and are filled with super-powered computers designed to store massive amounts of information gathered secretly from phone calls and emails. (AP Photo/Rick Bowmer) Francisco Kjolseth | The Salt Lake Tribune An aerial view of the Utah Data Center is seen in this photo from April 18, 2013. Al Hartmann | Tribune file photo Unified Fire Authority Chief Michael Jensen, seen here in 2010, said it's unlikely the Utah Data Center would suffer damage from a fire. 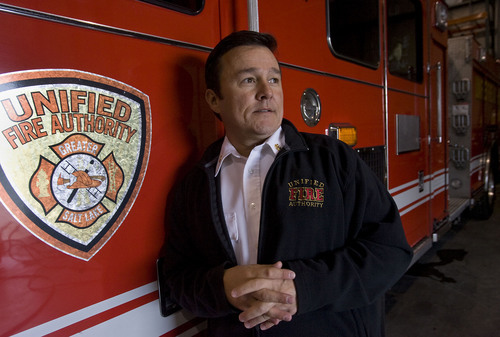 Rick Egan | Tribune file photo The Unified Fire Authority has responded to 13 calls for service at the Utah Data Center in 2013. 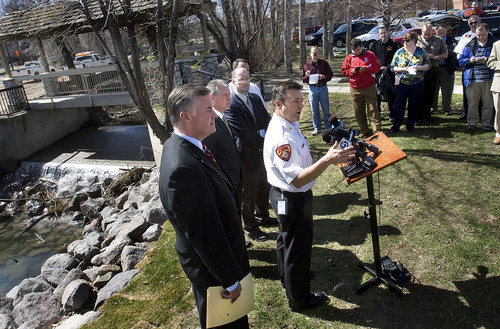 Scott Sommerdorf | Tribune file photo Michael Jensen, chief of the Unified Fire Authority, speaks at a news conference to discuss issues related to an expected high spring runoff, Monday, April 11, 2011. Chris Detrick | Tribune file photo Firefighers have made 13 trips to the Utah Data Center so far in 2013, according to records. Unified Fire Authority Chief Michael Jensen said that's not a surprise. 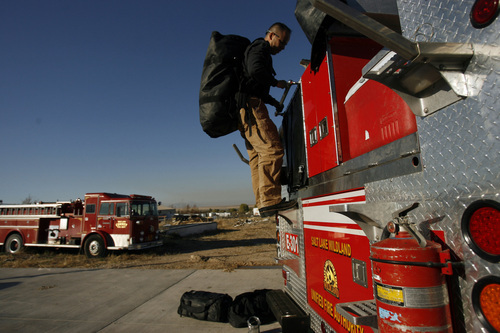 Al Hartmann | Tribune file photo Firefighers have made 13 trips to the Utah Data Center so far in 2013, according to records. Unified Fire Authority Chief Michael Jensen, left, said that's not a surprise. Jensen is seen in this 2010 photo with Deputy Chief Gaylord Scott. 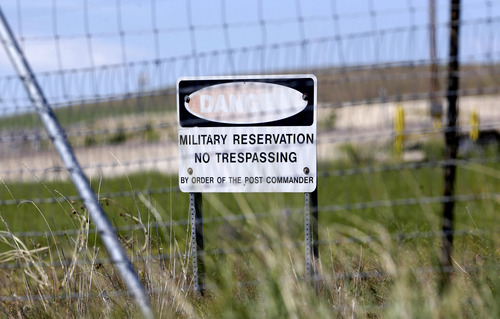 Rick Bowmer | AP file photo This June 7, 2013 file photo, shows a military no trespassing sign shown in front of Utah's NSA Data Center in Bluffdale, Utah. The nation's new billion-dollar epicenter for fighting global cyberthreats sits just south of Salt Lake City, tucked away on a National Guard base at the foot of snow-capped mountains. The long, squat buildings span 1.5 million square feet, and are filled with super-powered computers designed to store massive amounts of information gathered secretly from phone calls and emails. There was a lot of excitement at the Utah Data Center on the morning of Sept. 2. At 12:50 a.m., an alarm company called the Unified Fire Authority and said a heat detector and a sprinkler had activated inside the National Security Agency&apos;s new digital warehouse in Bluffdale. Dispatchers for UFA called a phone number for the data center, but records indicate firefighters had trouble reaching anyone there. The alarm turned out to be caused by a malfunction in the fire-detector system. Less than eight hours later, firefighters were back when a general fire alarm activated. Firefighters discovered someone was trying to reset the alarm from the earlier malfunction and instead triggered another alarm. Those were two of 12 fire alarms Salt Lake County-based UFA has received from the Utah Data Center in 2013, according to records The Tribune obtained through a public records request. All the alarms appear to have been false, or at least there was no emergency when firefighters arrived. UFA also responded to one case at the data center of a 35-year-old man exhibiting symptoms of appendicitis. The records make no mention of nor offer corroboration of electrical problems at the data center reported by The Wall Street Journal last month. Instead, it appears the alarms were the result of human error compounded by communication problems between NSAemployees and the UFA. NSA spokeswoman Vanee Vines issued a statement suggesting the false alarms were connected to systems testing at the Utah Data Center. "The number of calls was not atypical," Vines&apos; statement said. 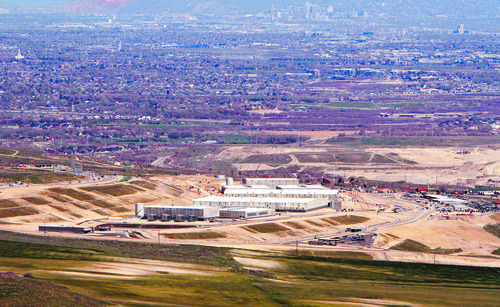 The NSA had long said the Utah Data Center would be operational by now, though The Wall Street Journal reported the electrical problems had delayed that. The NSA has not confirmed whether the center is operational. 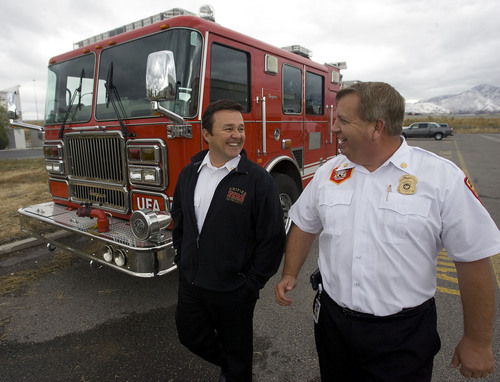 On Thursday, UFA Chief Michael Jensen clarified that firefighters do have the phone number for security at the Utah Data Center and the procedure is to call that number when the alarm company notifies UFA of a problem there. He also said the number of false alarms there haven&apos;t been a surprise. The contract the Utah Data Center has with UFA for fire protection anticipates 20 calls for service a year. The two sides arrived at that number in part by assuming the first few years at the center would see "glitches" triggering the fire alarm, Jensen said. After that, UFA anticipated one medical emergency a month and a false alarm again about every other month. Jensen doesn&apos;t see much likelihood offireat the Utah Data Center. "Those buildings are built to the absolute most modern fire standards," said Jensen, who also is a Salt Lake County councilman representing West Valley City, South Jordan and the west edge of the county. "There&apos;s not a lot that&apos;s going to burn." Jensen said UFA and the NSA were more concerned with UFA&apos;s rescue capabilities in the event of a terrorist attack or a disaster striking the Utah Center. The NSA put fire protection up for bid. UFA won and is receiving $343,000 over five years for fire protection, according to a contract that became effective Oct. 1, 2012. 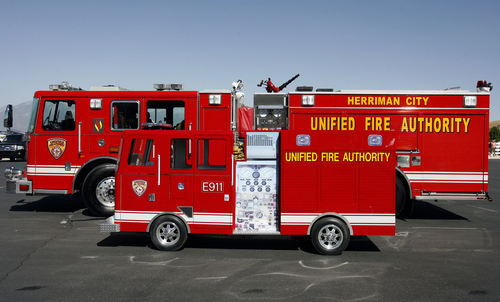 A UFA station in Herriman is closest to the Utah Data Center, but Jensen said for fire calls there, UFA also has been deploying engines from Riverton and Draper. Jensen said there is some risk of wildfire reaching the Utah Data Center, but the facility has defensible space and UFA and Camp Williams have worked to conduct wildfire mitigation.